Directions: The map directions will lead you to a beach access road where you can see the abandoned houses, but I don't believe you can park here. There are a number of nearby public beach access lots, so find the spot and then find some parking. 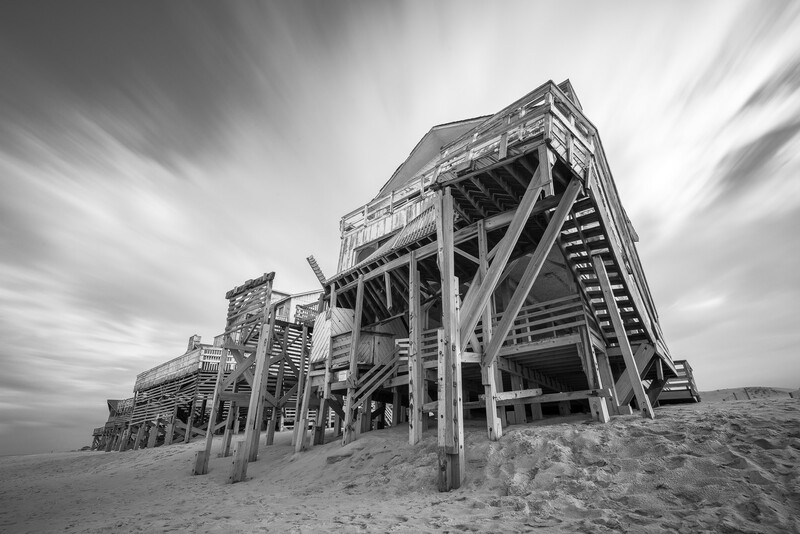 The erosion of Nags Head beaches will claim these houses soon enough, but until then you can capture some nice shot. Five beach houses in all and each one is very old and unique. I’d urge extreme caution to anyone who wants to venture inside of the homes. As you will see, they are in an extreme state of disrepair and are probably not very stable. Sunrise for some direct light or sunset for dramatic back-lighting, your choice, both will give you pleasing results. Bring your tripod, polarizer, and an assortment of ND filters for some long exposures. And watch your back, the Nags Head surf can sneak up on you. I am interesting in photography but don’t know how to start. Looks like you’re in the right place :) This website is a great resource for people just getting into the activity. I’d recommend looking through the article archives first. A little time and practice and you can learn to create the images you want.